Home » Blog » Home Improvement Tips » Is Rain Secretly Damaging Your Home in Lexington, KY? I’m the secret to creating life and the one resource you can’t live without. I create both beauty and destruction, while alternatively, I’m only a drought. 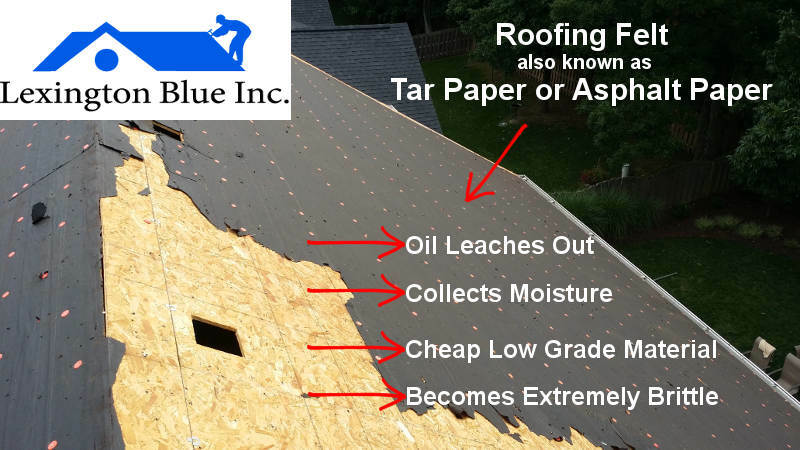 As roofers, we know you fall prey to rain damaging your home long before you even realize you have a problem. It’s “out of sight” and “out of mind”. It’s the same scenario with snow damaging your roof, you don’t see it happening, but it is. We’ve put together some information on how the rain can damage your home in Lexington, KY.
How is this important to you? Well, it may not be, but if you want to take precautionary measures like most prepared homeowners, a good place to start is having us look at your roof for free. This will ensure your home is well protected! Your home may be subject to a variety of entry points that allow water to cause damage. Age, quality of materials and unfortunately poor construction methods are all reasons associated with this. For now, let’s take a look at one of the most likely problem areas we find. Let’s start with a basic scenario we run into quite often. Here’s a roof that we had to replace due to many interior leaks. We started with the tear off. Here’s what we DID NOT find underneath! Lack of care during the original installation! Let’s take a closer look! It gets worse! X marks the spot where water penetrated the wood decking from not using felt all the way to the edge of the roof line. No felt running to the edge causes leaks! Here’s what it looked like on the inside! 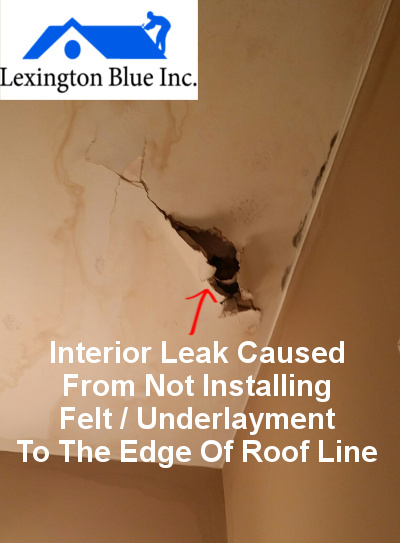 This interior leak could have been prevented! On a final note, here’s another entry point where the rain penetrated this roof. As you’ve seen from these examples, certain installation methods are generally overlooked. Shortcuts and greed are the only logical reasons why this is the case. 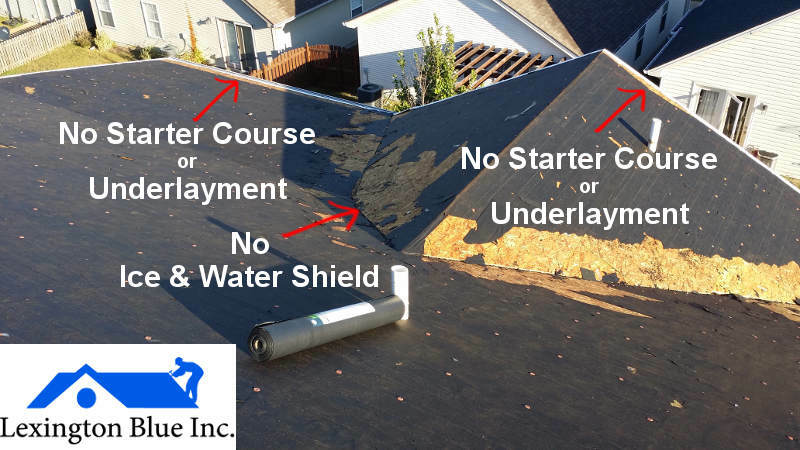 As with all poorly constructed roofing projects we see, the damaging effects could have been prevented if the roofer had just installed the products with care. Here are the obvious improvements we made to ensure this roof doesn’t leak moving forward. Using correct installation methods by installing synthetic felt as well as ice & water shield. Our process on this project was no different than any other installation. 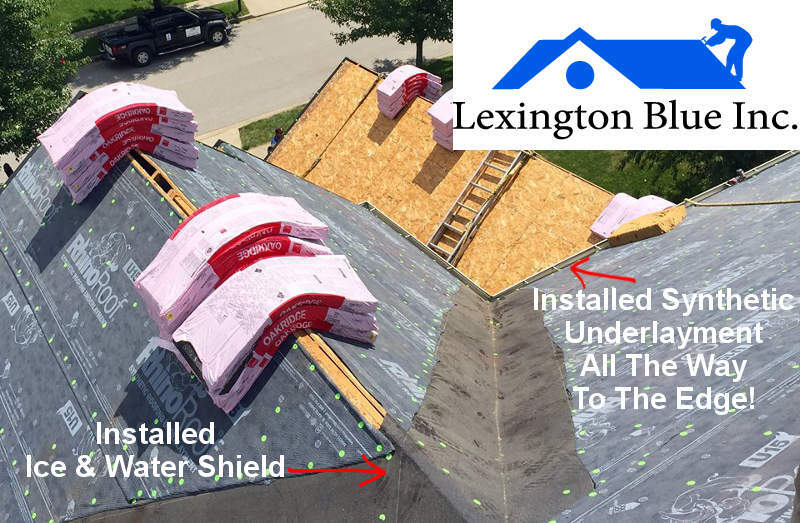 When we provide roof leak repair in Lexington, KY, we use the same approach as we would a new install. Don’t be fooled though, the materials used in the installation also have a tremendous impact on your roof’s ability to prevent rain water from penetrating your home. We take pride in doing things correctly the first time. We also make sure to use industry leading products and installation methods that stand the test of time. Roofing felt, also known as tar paper or asphalt paper, acts as a barrier between your wood decking and your shingles. We generally find the cheaper version of this product under most shingles we replace. 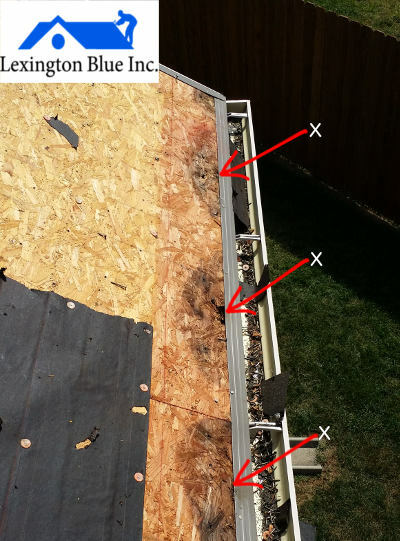 Cheap roofing felt causes home to leak. As you can tell from the image above, this material, although acceptable by industry standards, is not acceptable by our standards! Tip As a homeowner you should always question the materials being used under your shingles. With Lexington Blue, we leave no room for questioning because we always utilize the best materials on the market! 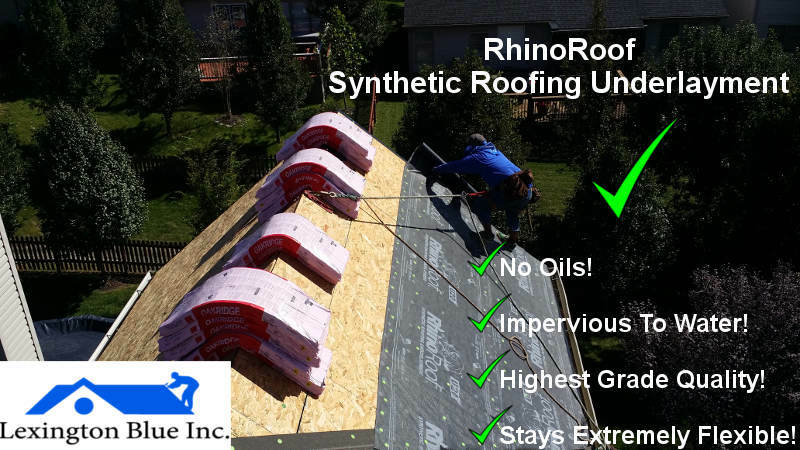 We only use the highest quality synthetic roofing felt to keep your home dry! When you think of professionals, what comes to mind? Do you assume all roofers take pride in their work? Have you wondered if you should even take your eyes off them as they are installing your roof? At Lexington Blue, we take our work seriously! We start the day with pride, work with pride, and finally at the end of the day, sleep with pride. Our commitment is to ensure you receive our best quality workmanship whether you’re looking or not! We use all the best materials, perform correct installations and make repairs that last! 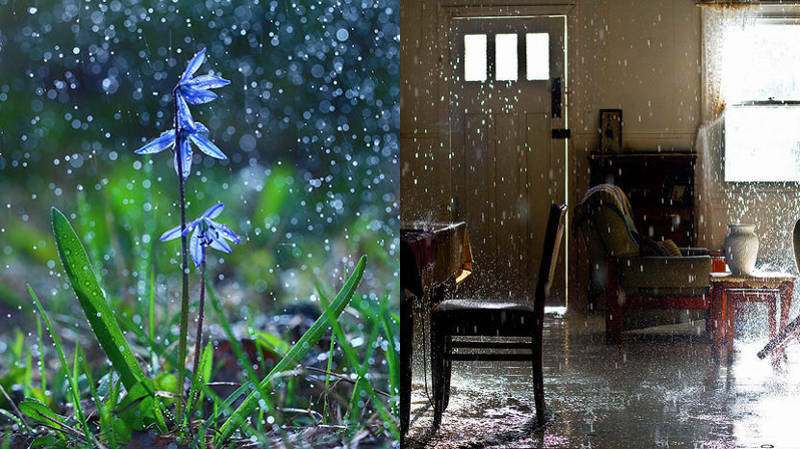 To keep your home dry from the rain, contact Lexington Blue for superior service.